Description: Create eye-catching drama and bold special effects to any setting with stunning geometric images of ambient light projected by Tortuga Luna, which features special optics that cast unique shadows on the wall. 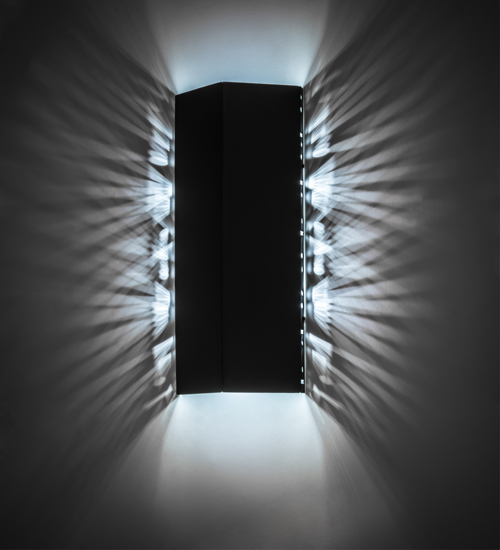 This architecturally designed wall sconce features a frame, hardware and a raised roof hand finished in Black. 14 energy efficient 1-watt LED lamps deliver outstanding quality of light while providing energy savings, reduced maintenance and a long lamp life. The fixture is handcrafted in Yorkville, New York. Custom sizes, styles and colors are available, as well as lamping options. UL and cUL listed for damp and dry locations.